GRENOBLE, FRANCE, August 3, 2016 /EINPresswire.com/ — HidnSeek is announcing today its first LoRaWAN™ product for the B2B market to link physical assets to the digital world. The new asset tracking standalone GPS module is available for European range (868MHz). 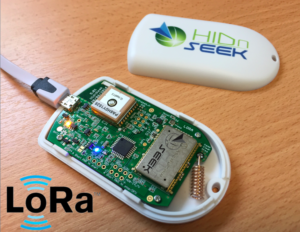 HidnSeek ST1-L for LoRaWAN™ is a low power and rechargeable tracker backed by smart services enabling real-time, widespread, geolocalisation and motion detection. The tracker hardware is customizable with further sensor integration allowing the deployment of new services. Our customizable web platform can offer flexibility in geolocalisation services for enterprises. If you are interested to evaluate and purchase the HidnSeek ST1-L LoRaWAN™ product please contact sales@hidnseek.fr or visit us on https://www.hidnseek.fr. HidnSeek, a connected asset management solution provider, based in Grenoble, France, was founded by Stéphane Driussi and Xavier Torres-Tuset. The company’s goal is to deliver an affordable and versatile IoT solution platform for enterprises, using scalable Low Power Wide Area Networks (LPWAN) such as SIGFOX, LoRa. HidnSeek have already successfully introduced the small stand-alone GPS tracker ST1-A, using SIGFOX network, with customers all across Europe and have recently introduced DigiTraq for the B2B market. HidnSeek won the best M2M mobility and Drones Innovation contest in Paris known as the “TROPHÉE DES OBJETS CONNECTÉS 2016”.